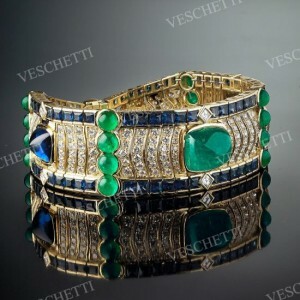 I would like to share with you my impressions after visiting the gorgeous Veschetti jewellery boutique in Forte dei Marmi, prestigious town in Tuscany. From the very shop windows which dazzled me with its exceptional beauty, magnificent jewels were showcased in the boutique decorated in a very elegant and refined style. I was a witness of the unique family history which creates fabulous jewellery more than half a century that I’m going to tell you in my interview with Marco and Laura Veschetti, the owners of the Maison Veschetti. L.C. 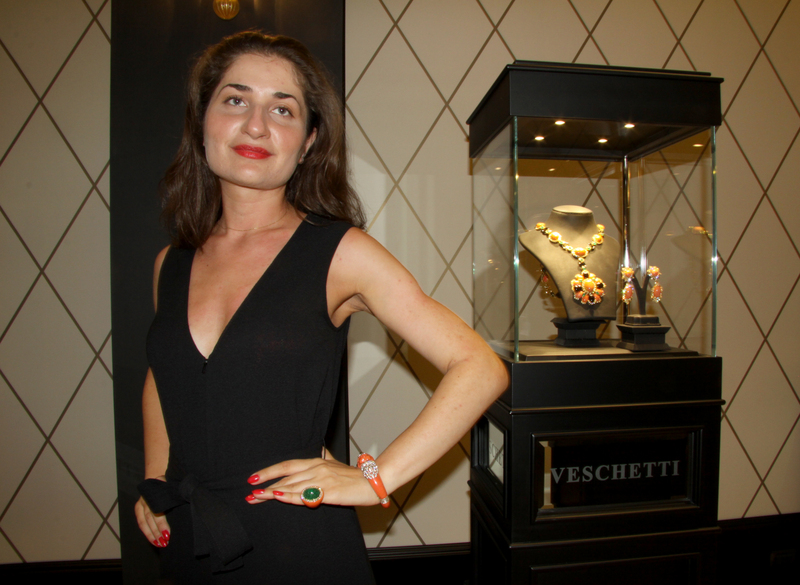 : When and how the brand Veschetti was born? M.V. 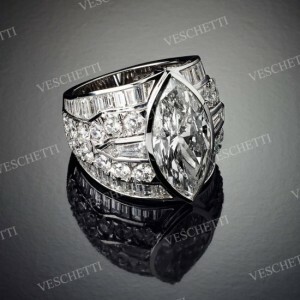 : The brand Veschetti was founded by our father Mario Veschetti in 1949 in Brescia, our hometown. Initially it was a small workshop where he started from repairing chains , then step by step he began to create his own jewels transforming the atelier into a jewellery shop. L.C. : Now the company is headed by Marco and Laura Veschetti. What are your roles? M.V. : I manage the creative part as well as the production phase, the stone purchase. I don’t consider myself an artist but one who knows more about stones, how to use them. Then our taste is very important; we could hardly able to create something we dislike. L.V. : Mainly I take care of marketing. I manage the organization of the events, trade fairs,especially in the Middle East, and the contacts with foreign clients. L.C. 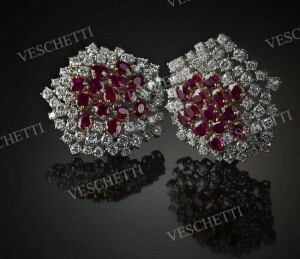 : What are the distinguishing traits of Veschetti jewels? M.V. : “The Collection” definitely has an inspiration that comes from the classicism then the result is to have shapes close to the items created in the years of 60,70 of international jewellers that have marked the history of jewellery. We are inspired without copying , by translating the designs into new shapes using different kind of stones with great skill, ability. 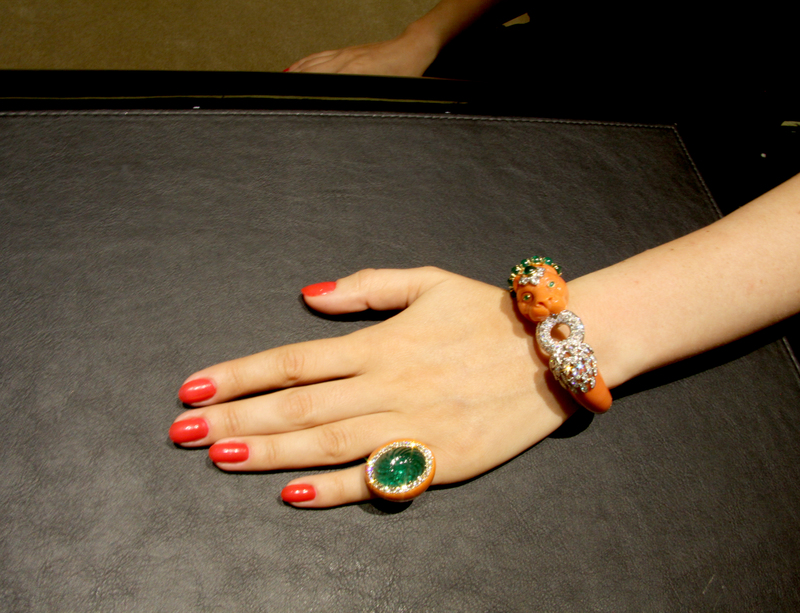 Our “one-off-pieces” are painstakingly created by the best craftsmen in Italy. We use a lot of semiprecious stones like corals, turquoises or wood, ivory combining with diamonds or precious stones.We must know how to use them, how to work with them. L.C. : Each collection you make shows us your amazing creative universe. Where do you get your inspiration? M.V. : The inspiration probably comes from the taste, experience, passion, the taste for beauty. The passion to travel the world and all of us in life we have this passion that create then the inspiration. The inspiration comes from a drawing, a building, an architecture, from everything beautiful. M.V. : Certainly if we speak about precious stones, diamonds are a great inspiration for us, a starting point, then we use semiprecious stones like corals, turquoises, amethysts that can transmit emotions. 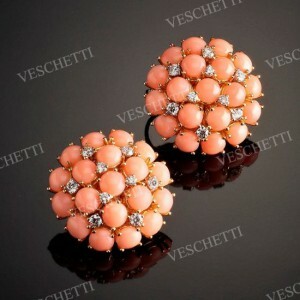 The game of colors is also important that is used by combining the coral with diamonds, or sapphires, rubies. L.V. : Italy still remains our target market , an important market that has allowed us to grow and now we are opened up to new markets especially those in the Middle East: Persian Gulf countries: Saudi Arabia, Bahrain, Kuwait. We are definitely interested in the Russian market , we still have to understand what is the right strategy to be able to begin to enter this market. L.C. 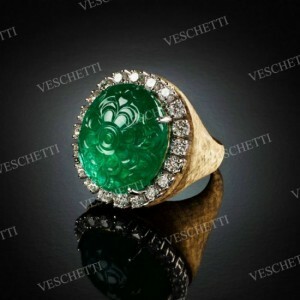 : Veschetti is an official dealer of David Webb, Scavia, Buccellati. Why did you choose these brands? L.V. : David Webb is the brand that mostly represents us in the sense that it has more affinity with our own taste, with the way we use the stones, with our style. M.V. : Our collaboration with Scavia was born many years ago. Definitely he is one of the great designers, even one of the few important designers of our times like David Webb in the 1960s, Cartier, Van Cleef in the 1920s. Scavia has a contemporary vision, he is a great artist who managed to create a sign, a drawing that then has become a source of inspiration for a large part of modern jewelers. Scavia also creates for us a few pieces, or on commission or for our clients. 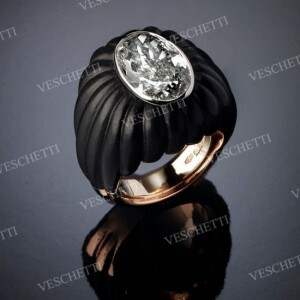 Regarding Buccellati, it is the icon of italian jewellery that has an identity so profound, so iconic. 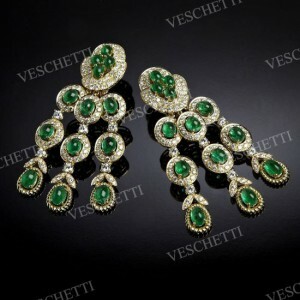 Buccellati represents the italianity that has his own inimitable and recognizable style. L.V.M.V. : Perseverance, passion, desire to never give up, passion above all; great commitment. Continuous and constant commitment. The commitment is easier if there is passion. M.V. : I’m never completely contented, let’s say I’m satisfied definitely… The most important thing is a continuous research, stimulus. Each result is a reason for joy and also a reason to do more and more, to engage more and more. L.C. :How do you define luxury? M.V. : Luxury is made of a moment of the soul, it is not something that is said, is spoken about; it is our moment, it’s very hidden. I think luxury is still try to find creativity, exclusivity but without ostentation, it is a special moment, an intimate fact. Luxury is within us. The Maison Veschetti creates sophisticated and elegant jewellery adornments, highlighting perfect marriage of tradition and innovation, featured original design and sumptuous details. 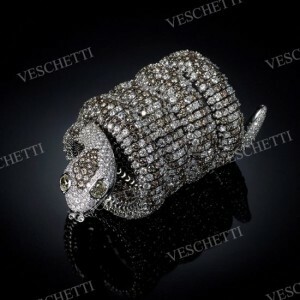 It’s without question one of the most prestigious Jewellery Houses in the world.